One of the EU LIVE project’s major goals is the design of environmentally compatible L-category vehicles. Within the development process, various simulation methods and techniques are playing an important role, which are nowadays considered valuable tools for vehicle development. As aesthetic effects for the design evaluation have not been adequately illustrated in the simulation environment, the techniques for the virtual exterior and interior design have started to attract attention only over the last years. On the other hand, CAE (computer-aided engineering) tools are already very successfully used in the characterization and calculation of various vehicle disciplines e.g. crash, NVH, chassis and powertrain development. Methods for computer-aided engineering and testing can help a.o. to define forms and target values, to specify needed characteristics and to validate already developed parts of the concept. Of importance is that everything that is constructed, tested, destroyed, changed and displayed at the virtual level needs later-on validation on hardware. As the cooling system of a hybridized or electric vehicle has more complex requirements than the one of a conventionally powered vehicle, the Virtual Vehicle uses simulations to investigate system build-up and conditions. Major parts of the vehicle like e.g. powertrain and chassis are developed by using various simulation techniques. The chassis is of importance as its form and structure influence strongly the energy consumption of the vehicle and the safety of the driver. The energy consumption depends to a very high degree on the aerodynamic characteristics of the vehicle’s chassis, as it influences the car’s air resistance. Especially at higher speeds, the proportion of the air resistance is the dominating factor of the overall driving resistance. Within the EU-LIVE project, the ideal chassis characteristics are developed with the help of CAD (computer-aided engineering) models as well as CFD (computational fluid dynamics) -simulations with a virtual vehicle model. For the CFD simulations of the L5e and the L6e vehicles, the simulation tool StarCCM+ by cd-adapco was used. In the second picture, an example of a CFD simulation is illustrated. 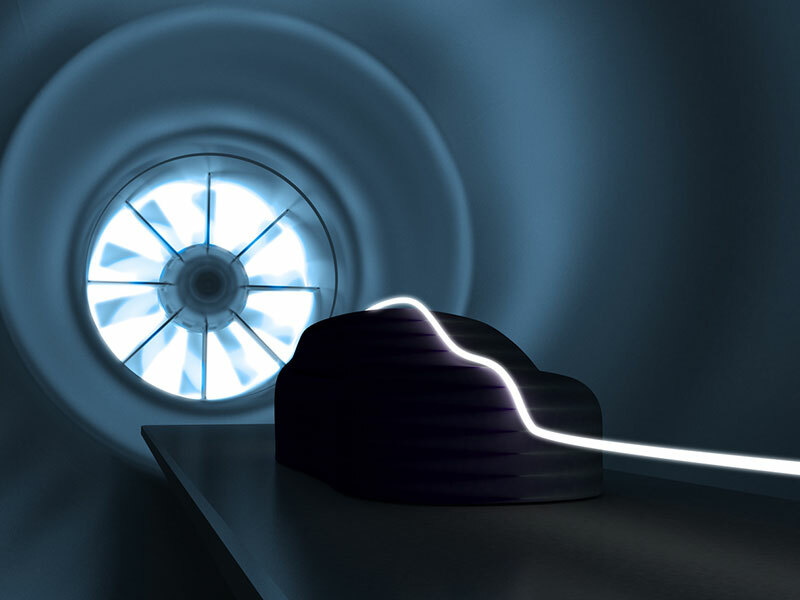 The scalar scene illustrates the vehicle that is positioned in a virtual wind tunnel and circulated by airflow. To assess the driver’s safety, the consortium performed a roof crush test. This test helps to determine the structural integrity of the cabin in case of a rollover of the vehicle, and to analyze the durability. In addition, the multi-body-simulation (MBS) of the chassis within different driving manoeuvers is used to evaluate the chassis set-up with regard to comfort and safety. Before assembling subsystem models, the interfaces between them are defined and the models are adapted accordingly. This so-called “top-down” approach (see third picture) enables the consortium to perform simulations already during early project phases by using coarser models (e.g. lookup tables). Therefore, fundamental design decisions can be made by means of qualitative analyses of the simulation results. With progressing development time, the models become more and more detailed and hence the results of the simulations can be assessed more and more quantitatively. However, it is essential to define the interfaces of the subsystem models before assembling them in order to ensure their compatibility. Due to this parallel performance of various simulation and design tasks, the “top-down” approach supports the shortening of the product development time frame.